Tweet Demetri Martin returns to Comedy Central for his second one-hour long special titled, “Demetri Martin. Standup Comedian.” The special will air on Comedy Central this Saturday, September 29, 2012. He recently stopped by to talk about standup comedy and his experience working the late night circuit. Q – You have an interesting style of comedy. It’s similar to Steven Wright and the late Mitch Hedberg. Which comedians did you watch growing up and was there one specifically that you learned the most from? Q – How do you keep material fresh when you’re writing? A - I try to write a bunch of different things; if I had to write jokes all day I think I’d go crazy. I would get tired of it. I try and write short stories, I draw a lot, I’m writing a screenplay so I have deadlines and have to write other things. And if I do enough other work, then jokes are always this nice refuge. Those were really the first things I tried to write when I first thought I’d be able to have a career as a creative person. And of course, most of my experience writing jokes has been through stand-up. So I think writing jokes is a way to escape, procrastinate or refuge from deadlines or some of the larger things I have to write. It keeps it fresh for me because I’m still excited and grateful that I get to write stuff and then go try it on stage. If you try and write a pilot or a movie, there are so many steps between your idea as it’s written and then finally present it, whereas stand-up you can try it on stage. And if you’re in the mood where you just think of stuff, you can say it right there in front of the audience. If I have to think about stand-up each day I personally would burn out; I can’t really do it that much. Q – How often do you write new jokes to incorporate into your act? A - If I’m doing shows, I’m writing jokes every day. With my smart phone or pen and paper, you use those to capture ideas. I like to go for walks, so when I walk I listen to music and write in a notebook, type things into my phone. Once I have a real deadline, once I book a tour or special, that, of course, accelerates things. The jokes take the front seat and then the short stories might become my escape. Generally, I’m usually writing jokes and most of them are not going to be very useful. I don’t worry too much about it. I write a lot of them. I kind of improvise on stage. Once I have about 100 jokes that work pretty well, I have a headlining set. I have some short stories that I like to tell on stage but the core of my act is still short jokes. 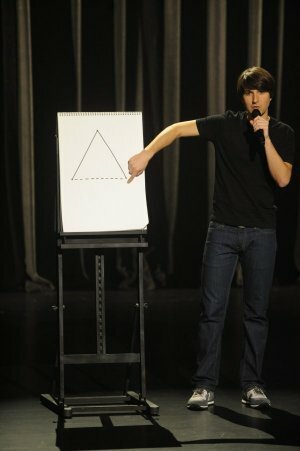 Q – The new Comedy Central special, "Demetri Martin. Standup Comedian," premieres on September 29th. How is this special different than your previous one hour special? Do you still have the easel and the guitar on stage? A - I do. Those are probably only the vestiges that are similar to the other special. And the one liners. Q – You’ve also appeared on the late night shows (Conan, Kimmel, Leno, Letterman). When you do the late night circuit, do you have specific jokes that you do primarily for television?